Useful information about the Opoutere area brought to you by the Opoutere Ratepayers and Residents Association. Autumn has arrived, the days are getting shorter and cooling down. These changes in the season always herald the Easter period and the first set of school holidays for our Opoutere family. Easter runs from Friday April 3 through to Monday April 6, the school holidays run until mid April. It’s a great time to catch up with people that you haven’t seen since the summer holidays and to get on top of a few jobs before winter creeps in (who doesn’t love clearing guttering…?). While there is a good group of people around it’s a popular time to get some community involvement on some important issues as well. 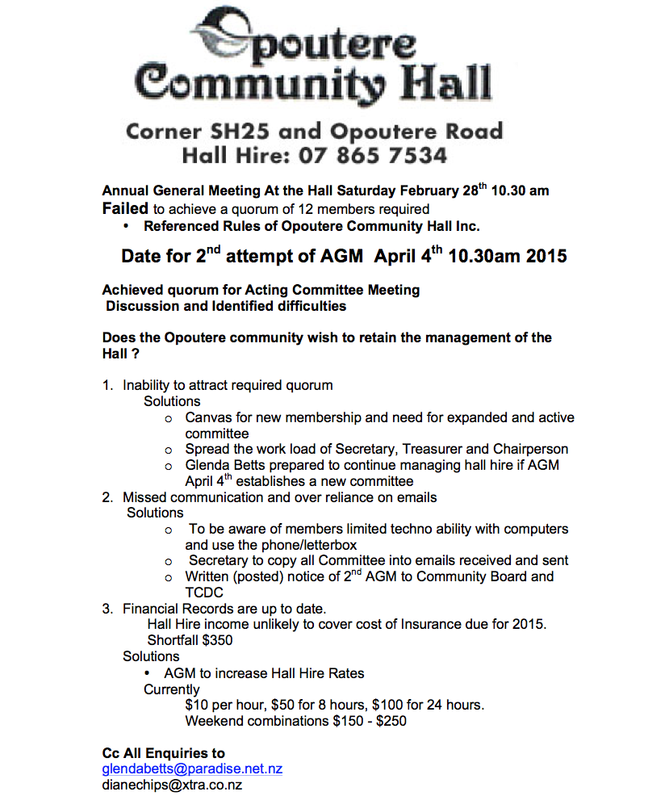 On Easter Saturday the Opoutere Community Hall Society are having a second attempt at their AGM. A quorum couldn’t be achieved for the first AGM in February so they are trying again. If you have an interest in the Hall please attend this meeting to make your views known and participate in the election of the new committee. There is also another amazing, slashing, shredding Weedbusting Working Bee amongst the elaeagnus behind the Opoutere YHA. We are making great progress against the elaeagnus and uncovering some wonderful coastal broadleaf forest in the process. To support the Hall society’s AGM and allow Saturday’s keen cricketers to attend the working bee we are rescheduling our working bee from Saturday to Easter Sunday 2pm. We will meet at the cemetery paddock just beyond the YHA and its neighbouring houses, drive up the gravel driveway and park by the far fence in the paddock and you’ll hear a chainsaw or two in action. Parking: The landowners have very kindly allowed us to park our vehicles and bicycles in the paddock. This allows us much safer access to the areas of elaeagnus that we have reached in past Working Bees. Bring: Sturdy boots, long pants and top, gloves, safety glasses, ear muffs, hand saws, loppers, chainsaws and petrol, hedge trimmers and a good sense of humour. For those of who are in the grip of cricket fever (this phenomenon was a mystery to some of us until NZ vs SA) you may be interested in the Annual Village v. Beachboys Opoutere cricket game, to be held at Graham Oval, Easter Saturday 4.4.15, starting @ 2pm. “There is a quiet confidence for another huge win for the Beachboys, who are defending the title they won comfortably last year. I have given the pitch its first serious mow last weekend, in preparation for the event. With the dry, hot summer predicted to continue for some weeks, it’s likely that the outfield will be fast (for those who prefer to do their scoring in increments of 4). The trophy has had the traditional addition made. Not to be dismissed as just a casual game of cricket between friends and neighbours, this is serious business. Opoutere’s bravest will be donning whites and taking their performance enhancing drugs (hot cross buns) before entering the fray. Good luck to all, may the best team win. So mark these events on your calendars, it’s going to be a busy time! Death To Ginger! A fun working bee.